DeadLine by Judy McDonough - "A Single Word ... "
With the front door open, you give a light knock & walk in. The sounds of the house is buzzing and bleeping from the modern day devices that are needed to make one or both occupants comfortable as possible. The drone of the TV also can be heard as the man sleeps quietly on the loveseat in a mid-afternoon nap. But looking around you notice that one person is missing. Now where did she go? You quickly check out the other rooms in the small cottage. Nothing. The vehicle is still in the drive and her shoes are still in their normal spot by the door. Bewildered you continue to look around. There is no note of any kind, nothing seems out of place. Then your eyes sweep the living room one more time. The cats are watching something through the screen door facing the river. You look out and discovered where she is on this cloudy summer day with a gentle breeze and a shaded back yard. Out the door you go, not wanting to disturb her peaceful moment outside. It's not often that you will find her outside, unlike most people she does not worship the sun. In fact you know that she is almost vampire-like in the way she avoids it. Having found her curled up in the hammock, you stand there watching her without betraying your presence. As you listen to the movement of the river, you see that under her wide brimmed hat, she has fallen asleep with a book on her chest. You wonder over and take a peek at the book that lays there and discover that she also has her e-reader with her. It's facing up and with a quick glance you notice that it on the last page of book she was reading on that one. You carefully pick up the book that lies on her, place the book marker in between the pages; then close the novel to set it back down next to her. You know her well enough to know she never likes to treat a book in that matter. For according to her, that it weakens the binding and causes the pages to come apart. And with one last look, you turn around without disturbing either party as you leave. Does this sound like you my fellow readers? Have you been found fast a sleep with a book close at hand? Does your friends and family understand the draw of a good book? This actually happened to me here at my house when I reading Deadline by Judy McDonough according to find of mine stopped by. Well in my family this is normal. As it was with my mother, her daughters, her grandchildren and now great grand children. Those who knows us know that either cash or books make the perfect gift come birthdays and holidays. We would accept gift cards to book stores or even to general stores that carry books such as Wal-mart, Kmart's etc. If you want to change things up then you would give us some thing for our particular craft that we do like quilting, yarn arts or embriodery. Caroline's life is on track. She's about to get her nursing degree and she's engaged to rich, handsome Trevor. But, before they get married, Trevor wants Caroline to spend the summer in Louisiana, getting to know her father, who's never been in her life. She reluctantly agrees and heads south, deep into bayou country where she meets Cade. Charming and handsome, he's pulling out all the stops to convince her that he's the man for her, not Trevor. As she becomes frightened by a series of strange accidents that began after her arrival, she learns that the woman haunting her dreams is actually a long-dead family member come to warn her about the men in her life. 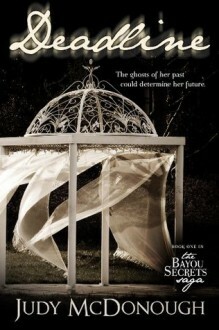 Caroline soon realizes that if she doesn't solve the mysteries from the past, they could permanently alter her future. This book was awesome!! As my son would put it. I purposely slow down in my reading on this one because I had hoped that my library was able to obtain a copy of Lifeline, the second book in this series. Who knows, maybe I will get a chance to review that book too. Hey! I can dream... can't I? But after a discussion with my local librarian it appears Judy's books will soon make an appearance upon my recommendation. There are so many factors that I enjoyed about the story. The pace was quite steady with a suspenseful twist throughout the plot line. The on-going dream sequence between Caroline and Rachel was an interesting way to bring a touch of paranormal time traveling to the story line without bogging the whole book down. It allows the reader to understand how the relationships between Caroline, Cade and Eddie, Caroline's estranged father. But then you there to also see the negative tension between Caroline with April and her Fiance - Trevor. And this all coming from Caroline's point of view as the events unfold over the time span of a couple of months in the summer. Judy bring the story, the characters and atmosphere right to you with a well balanced and well researched bringing her knowledge in order to enrich the story. I'm really sad to say that I finally finished this book and like I said earlier, I tried to draw it out for as long as I could. That leaves me saying that I am giving this book 5 out of 5 possible stars. Thank You Judy for writing a book that I just couldn't put down. I love it so much that I know that this book will be on my "Re-read" list. This one will be in my collection a long time as you took the time to sign it! Well that it is for this one folks. Until next time... with "A Simple Word."